Quarterbacks: Micah Kaneshiro (Moanalua), Ryder Kuhns (Saint Louis), McKenzie Milton (Mililani). Running backs: Dusty Flores (Baldwin), Brandon Kahookele (Kamehameha), Polikapo Liua, Jr. (Kahuku), Austin May (Campbell), Adam Noga (Saint Louis), Triston Pebria (Kapolei), Tristan Spikes (Hilo), Mahvan Tau (Waianae), Randon Tuitama (Kaimuki), Jemery Willes (Waianae). Wide receivers/slotbacks: Bronson Ader (Mililani), Jayce Bantolina (Campbell), Dylan Combs (Punahou), Shaenan Hernandez-Fonoti (Aiea), Kawelakeapono Keao-Mata (Baldwin), Donald Lambert (Moanalua), Luke Morris (Punahou), Kainoa Perry (Campbell), Jason Sharsh (Moanalua), Trent Sitar (Punahou), Kainoa Wilson (Mililani). Offensive linemen: Jordan Agasiva (Mililani), Miki Fifita (Baldwin), Marcus Malepeai (Kailua), Jason Tara-Antone (Hilo), Andru Tovi (Mililani), Louis Vailopa (Saint Louis). Defensive linemen: Ruairi Brady (Punahou), Alexander Ezera (Baldwin), Kaaumoana Gifford (Kamehameha), Isi Holani (Hilo), Canton Kaumatule (Punahou), Tristan Ludiazo (Campbell), Ratu Mafileo (Moanalua), Peter Sagapolutele (Saint Louis), Joseph Saula (Punahou), Toese Tia (Campbell), Kalani Vakameilalo (Kapolei), Salanoa Wily (Kahuku). Linebackers: Manaia Atuaia (Kahuku), Boyd "Kalama" Chung (Punahou), Tevarua Eldredge (Baldwin), Ofa Fahiua (Hilo), Waylen Lindsey (Campbell), Faafatai Lulu (Saint Louis), Ronald Matautia (Waianae), Saitui Moeai (Punahou), Clifford Ramseyer (Kahuku), Chad Souza (Kamehameha), Tumuauatasi Tuinei (Punahou). Defensive backs: Roger "Tre" Boyd (Farrington), Tristan Centeio (Kapolei), Bryson Hughes (Kapolei), Dylan Kane (Kamehameha), Mata Leota (Mililani), Jayven Sablay (Kamehameha), Guy Silva (Campbell), Micah Todd (Saint Louis), Jaren Zadlo (Mililani). Place kickers: Ricky Casco (Baldwin), Naia Graham (Kailua), Jae Won Huh (Aiea), Marc Matas (Mililani), Jake Samsel (Kahuku), Kekoa Sasaoka (Farrington), Stanton Spencer (Waianae), Arielle Stoyanow (Kapolei). Other coaches that received consideration: Amosa Amosa (Campbell), Dave Baldwin (Hilo), Doug Cosbie (Kamehameha), Randall Okimoto (Farrington), Rod York (Mililani). How do you replace a three-year starter at the quarterback position? That will be the dilemma the Buffanblu face without Tuileta, their steady field general, at the controls of the offense in 2014. The 6-foot-3, 205-pound senior threw for 2,618 passing yards and completed passes at a 60.9-percent rate. He threw 28 touchdown passes — including 12 in Punahou's final three games — and was intercepted just five times all year. It goes beyond the numbers, however. Tui was simply masterful when it counted the most. In two wins over Kamehameha this season, Tuileta passed for a combined 601 yards with five touchdowns and no picks. Against Saint Louis, he recorded five scores through the air and 298 passing yards. In his team's three postseason games, Tuileta amassed 1,090 passing yards. For his efforts he was named Offensive Most Valuable Player by the Interscholastic League of Honolulu and for a second consecutive year, Gatorade State Player of the Year. Tuileta, who will play football and volleyball at the University of Hawaii, completed his prep career with 6,930 passing yards and 76 touchdowns against 19 interceptions. He became the all-time leader in career passing yards (1,730) and touchdown passes (19) in the state tournament with Punahou's 28-22 win over Mililani in the Division I title game. In 2012, Padello was a nice player on a good team. This season, he became the superstar on one of the best defenses in the state. The 5-foot-11, 200-pound senior defensive end terrorized opposing offensive tackles and was a nightmare for quarterbacks all season long, to the tune of 20 sacks. He is hardly the prototypical defensive lineman, but possessed an uncanny ability to beat blockers off the edge and get into the backfield. Padello used speed and technique to abuse offensive linemen who were much taller and heavier than him and was especially dangerous on passing situations. In Mililani's two games against Punahou this season, Padello racked up five sacks — including four in a non-league game while working mostly against standout Buffanblu lineman Semisi Uluave, who stands 6-feet, 5-inches and weights 315 pounds. He followed that up with another sack and a forced fumble against Kapolei a week later and totaled six sacks in five Oahu Interscholastic Association Red West Conference games. Padello notched half of his sacks in one four-game stretch this season, which included playoff wins over Leilehua and Kahuku. He had a season-high seven tackles with four sacks against the Red Raiders in the semifinal round of the OIA Red Tournament. Three weeks later, Padello added to his already state-leading total with three more sacks of Campbell's elusive quarterback, Isaac Hurd, in a state semifinal game that the Trojans dominated. In a vote of league coaches, Padello was named Red West Defensive Player of the Year and was one of six Mililani defenders named to the division's First Team. Ane did what no other coach in the ILH could do in 17 years: go undefeated in what is arguably the state's toughest league year-in and year-out. The Buffanblu capped a perfect 11-0 season with their 28-22 win over Mililani in the Division I state championship game to capture their second title in school history and first since 2008. After heart-breaking runner-up finishes in 2011 and 2012, Ane helped mold some of the state's most talented football players into into a championship team. 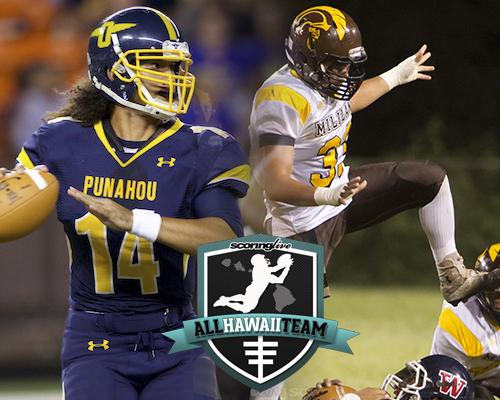 Punahou lived up to its billing all year long. They were the first team in the three-year history of the ScoringLive/OC16 Football Power Rankings to hold the No. 1 spot from start to finish. All year long the Buffanblu remained focused on their goal that had eluded them the previous two seasons. The season's motto — to "finish" — was just what they did, finally realizing the potential they had all along and bringing home the hardware that "BuffNation" had so desperately longed for. Ane is a 1971 graduate of Punahou who played collegiately at Michigan State and professionally for seven seasons for the Kansas City Chiefs and the Green Bay Packers in the NFL. He won his 100th game as a prep coach back in August and became the winningest coach in Buffanblu history this season. His 110-53 career record gives him the 18th most wins by a coach in Hawaii high school football history and ranks fourth amongst active coaches. Ane was named co-ILH Coach of the Year. ScoringLive's All-Hawaii teams honor standout Division I and II athletes statewide. Selections are made by SL staff in consultation with media and coaches.